There are plenty of free email services which let us create a free email account and send/receive emails. But for fun or for some personal work, we need anonymous email services. Anonymous email services help users send and receive emails without revealing their real identity. There are many websites available which offers anonymous email services. Before discussing those services, I want to make it clear that no service is secure enough. No anonymous email service ensures that you are not trackable. Anonymity is only possible by hiding your IP address. So, you must use TOR or any other VPN services before using these services. Here are some anonymous email services that let you send or receive emails. Few services also offer encryption for secure emails. Few people also say these email services as Fake email senders. TorGuard is a popular service that provides anonymous inbox with lots of features. It offers 10 MB storage, privacy features, cryptographic features G/PGP encryption and end-to-end encryption. CyberAtlantis offers an easy to use interface for sending anonymous emails. It doesn’t including your IP address in mail headers to make you untraceable. It also asks for no personal information. The Anonymous Mail is another nice email service offering anonymous emails. You need to create a free account before using it. After having an account, you can send anonymous emails to any person without revealing your actual identity. 5ymail offers sending and receiving or rich text emails for free without revealing your true identity. It has a detailed form where you can enter the Recipient Email, subject, from Name, from email address and email body. For faking the from email address to anything you desire, you need to sign up for an account. There is also a paid version of the email service. Paid versions get more features. AnonEmail is also a nice anonymous email service. So start sending emails without revealing your real identity. It does not ask to sign up. You just need to enter the To email address, subject and message. It doesn’t reveal anything about you as it never asks anything. Secure Mail encrypts your email using 4096-bit key encryption. In this way, your emails are unreadable by any unauthorized person. For sign up, it never asks for any personal information. So, you do not worry about your privacy. It also has a zero-tolerance policy against spam. It uses SSL encrypted connection and protects your IP address and identity. This website (anonymousemail.me) offers a simple form to fill. There are few features for premium users like setting the from name and email. You can also set an email to receive the notification when your email was read. The premium service costs $59/year. W3 Anonymous Remailer is also a nice tool to send anonymous emails to anyone. You just need to enter the receiver’s email address, email subject, and email message. 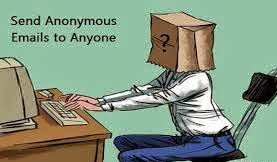 Send Anonymous Email is also a similar service where you can fill a simple form and send an anonymous email. You can set the sender’s email to anything you want. There is no requirement for signup. So, you are anonymous. Send Email Message is also a good anonymous email service provider. Just fill a simple form and send the anonymous email. The tool is free to use and works fine. These are a few websites that let users send and receive anonymous emails. You can use any of these anonymus email service provoders. By a Google search, you will find so many other similar kind of websites. If you use any other anonymous email service that works fine for you, share the name with us using the comments.